Figure 1. Systemic administration (i.v.) 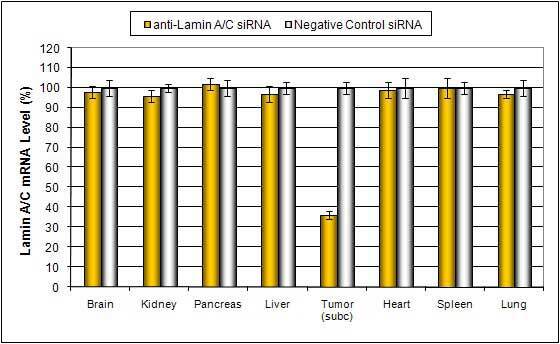 of Liposome-PEG based In Vivo reagent conjugated with siRNA targeting Lamin A/C mRNA or non-silencing control siRNA following the recommended protocol. Tissues were collected and RNA isolated 48 hours after first injection. 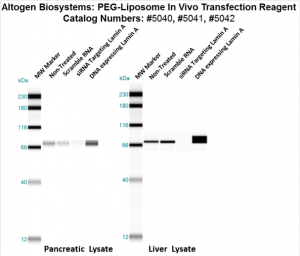 Samples were analyzed by qRT-PCR for Lamin A/C gene expression levels. Ribosomal RNA levels were used to normalize the Lamin A/C data. Data are means ± SD (n=6). Figure 2. Intratumoral administration (i.t.) 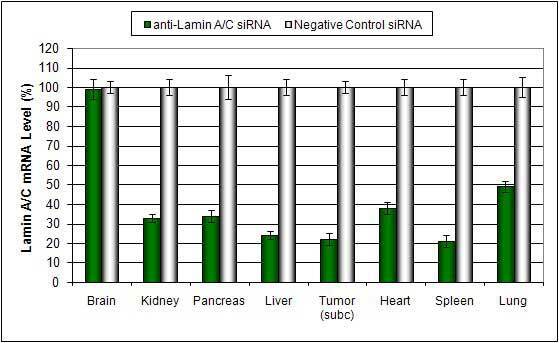 of Liposome-PEG based In Vivo reagent conjugated with siRNA targeting Lamin A/C mRNA or non-silencing control siRNA following the recommended protocol. Tissues were collected and RNA isolated 48 hours after first injection. 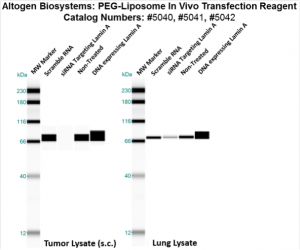 Samples were analyzed by qRT-PCR for Lamin A/C gene expression levels. Ribosomal RNA levels were used to normalize the Lamin A/C data. Data are means ± SD (n=6). Figure 3. Systemic administration (i.v.) 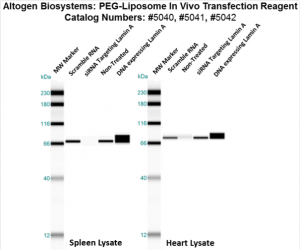 of PEG-Liposome In Vivo Transfection Reagent conjugated with 80 ug of chemically modified siRNA targeting Lamin A/C mRNA or non-silencing control siRNA following the recommended protocol. Tissues (Liver, Brain, Muscle, Kidney, Tumor, Heart, Spleen, Lung) were collected and total protein fraction isolated 72 hours after first injection. 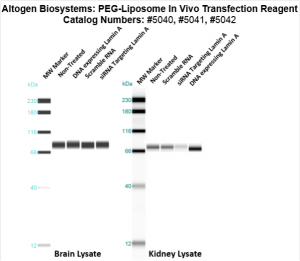 Samples were analyzed by Western Blot Analysis for Lamin A/C gene expression levels.